'tis the season! to avoid the crazy crowds in maddening malls! and if you wanna eat what you gonna do? well, hello, there are lots of places to eat in outside of greenbelt and glorietta, 'no? and one new place we've been waiting to open is called aubergine. now why would anyone name their place aubergine? first of all, what the hell is an aubergine? and how do you pronounce it? and no, they don't serve exclusively aubergine dishes, the way guava serves guava-infused dishes. the resto is located on the second floor of a building in fort bonifacio, away from the crowded serendra and the fort areas. and it occupies practically the entire second floor—it's huge! inside it's bright and clean and the interiors kind of remind us of a hotel coffee shop, and we don't mean that in a bad way. 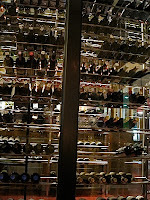 and instead of a buffet table spread in the center of the room (hehe), the main attraction is a glass-encased wine cellar. it's so big, you can actually set up a romantic table for two in there. but we opted for a regular table for two. 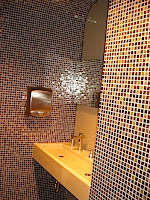 (we have to comment on the rest room, though: for a restaurant that big, they only have one toilet stall in the ladies' room. or did we miss another one on the other end?) 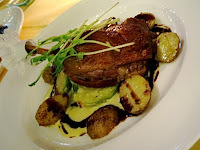 we went straight to main course and ordered french duck confit with creamed brussels sprouts and parsley marble potatoes (P740). the duck leg was cooked to perfection with just the right amount of crunchiness, but we gotta ask, who the hell likes brussels sprouts? sure, they look cute on a plate, but they taste just as bitter as ampalaya. 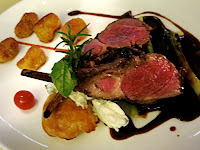 we also ordered roasted pineapple glazed australian rack of lamb served with tamarind jus, ratatouille, goat cheese tart, and pumpkin gnocchi (P1,180). when asked how we like it done, we said whatever the chef recommends. well, this looks too pink, don't you think? a little longer on the grill might have been better. our fault! and all those little side dishes with different flavors (sweet, sour, salty) somehow did not complement each other and left us with confused taste buds. 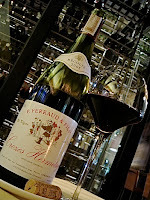 all washed down with a côtes du rhône syrah (P1,950). all that plus an asparagus soup (P220) plus 12% VAT (it was not included in the menu price, so prices are always deceiving that way) plus 10% service charge, added up to a grand total of P4,455.20. typical for a fine-dining restaurant. we'd come back (although not too soon—there's still christmas shopping to spend our hard-earned money on! ), if only to try the other dishes, or share a bottle of wine with friends during happy hour with friends at the bar, or have merienda of coffee and cake with your mom. 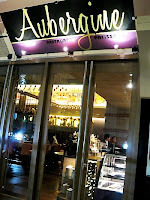 aubergine restaurant patiserrie, 32nd and 5th building, 5th ave. corner 32nd st., fort bonifacio global city, taguig city, tel (2) 856-9888. Hi! I love food and trying out new restaurants is a Saturday ritual for me. This Saturday, April 19, we tried Aubergine. Sharing my horrible experience at at that restaurant with you -- we only ordered the wagyu with foie gras and oysters. The oysters came and went, but the wagyu took over 40 minutes -- all because the chef was outside the kitchen! It was only when he went into the kitchen that they cooked the wagyu. Which was four measly pieces of steak and 2 miniscule portions of foie gras. Here's the best part: when I complained about the delay in serving our food the the owner, he said (and I quote) "if you don't like it, don't come back." The owner is a racist pig who should not be insulting customers that have a right to complain. Summa total: Bad service, food not worth the price, bad mannered owner. FYI to all your readers -- beware of restaurants owned by bastos foreigners. They should be deported. As a professional in the hospitality industry for over 30 years and today an educator to Filipino Youth in culinary arts. Aubergine was built by us owners with the sole purpose that our students do get a professional internship in view of our schools objective to send them abroad, noteless to say to train Filipinos in international standards and for them to be internationally successful. However the words she is using to describe me are I believe very unbecoming and untrue and in all fairness I believe this comment of her should be removed form all sites she is posting it. 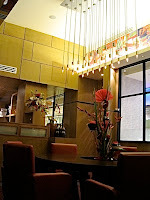 I have eaten at Aubergine a few times and have had the pleasure of meeting the owners. Hans is a very hospitable person. I could not believe he would say what M said he did, unless there was good reason. All is now clear, m was being a real brat, Hans told her exactly what any other decent restaurant owner would. Good for him! is this restaurant associated to the one in chelsea? where chef Gordon ramsay and marco pierre white used to work or is it just a rip off? Thanks to Fashpack :) for supporting all reviews on the blog, whether good or bad. That's what reviews really are--honest opinions of an experience. To Mr. Schallenberg -- shame on him. If he is really an educator, the last thing I would have expected from him is to say something like "If you don't like it, don't come back." That should not be on any school's curriculum, much less a culinary arts school. Note that he does not deny the delay in serving the meal, or that the portions were small, or that the chef was outside. It is only the comments that he is contesting. In essence -- he is confirming that I do have the right to complain. While I would have loved to walk away in the face of such rudeness, I still paid the bill. And for that, you tell me not to come back? What happened to good service? To the saying in the hospitality industry that "the customer is always right?" If the comments are untrue as you said, put your money where your mouth is. Make sure that all your customers are served on time and are treated with respect. Be accessible to people who have complaints and accept criticism. You are a guest in our country, Mr Schallenberg. Make us happy to have you here.